The first violin part for Mozart's Symphony No. 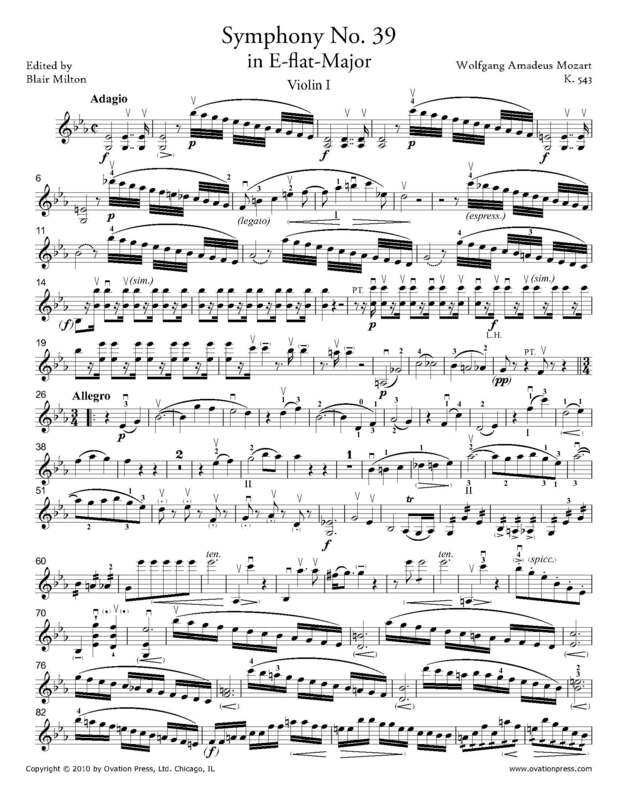 39 in E-flat major, K. 543 has been edited by Blair Milton, violinist in the Chicago Symphony Orchestra and founder of the Evanston Chamber Ensemble. Milton's bowings, fingerings and other editorial markings have been added throughout the score. Mozart's Symphony No. 39 is the first of his last three symphonies, a set he composed in rapid succession during the summer of 1788. Some consider the last three symphonies as a unified work. In particular, Symphony No. 39 has a grand introduction (in the manner of an overture) but no coda. With an unknown premiere date, it is possible that the symphony was not premiered during Mozart's life. However, today it is frequently performed and recorded, being regarded as part of the core repertoire. Download and print the score today to gain access to expertly edited Mozart Symphony No. 39 violin fingerings and bowings from Blair Milton!